Conchita Wurst, the drag persona of Austria's Thomas Neuwirth who won this year's Eurovision song contest, has come in for a lot of cricitism in Russia, but this hasn't stopped Moscow hairdresser Serge Klimov from taking inspiration from the singer for a new hair salon, his second in the city. The entrepreneur plans to name his new salon Wurst, where visitors will be provided with food, drinks and a karaoke machine, as well as pricey treatments. Seeing the new project as a salon-meets-club, the salon's legal representative Irina Solovyova told newspaper Izvestia that “anyone able to provide a faultless rendition of Wurst’s song Rise Like a Phoenix will be served for free”. Solovyova has been quick to address questions around how the new project will operate in light of Russia’s anti-gay propaganda law brought in last year, confirming that the salon will only admit over-18s, “so as to avoid accusations of spreading gay propaganda to minors”. 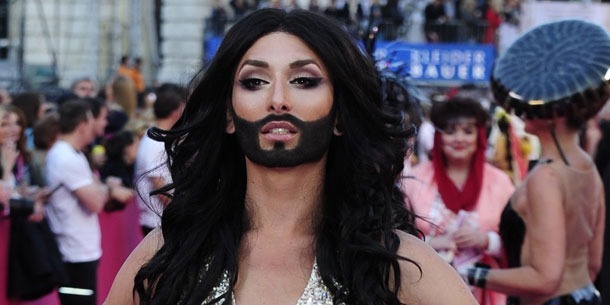 Wurst's victory at Eurovision this year sparked outrage in Russia, with many calling for officials to have Wurst banned from travelling to Russia. Minister of Culture Vladimir Medinsky announced his regret at not being able to fulfil the plea of politician Vitaly Milonov to ban Wurst. Milonov said: “This creature of indeterminate gender is an insult to the majority of the Russian population, and any other country in fact.” A spokesperson from the ministry noted that the department was unable to ban “visits from bearded men or women to Russia”. Despite aggravating homophobic sentiment from a number of public figures in Russia, Wurst's song nevertheless made it to number one in Russia's iTunes download chart only days after Russian public figures censured Wurst's victory. Although the project is still in its infancy, Solovyova has also remarked that Conchita Wurst will be invited to the salon's opening, although she has yet to be contacted.